I'm beginning to think about preparing to start to commence studying a possible plan for quilting this recent Rocky Road to Kansas. Yes, my brain is NOT focused, and every time I get on a direction, some diddly nothing changes my direction - what's with that??? Here are some samples, and disappointments, or I should say, "not yet successful designs." 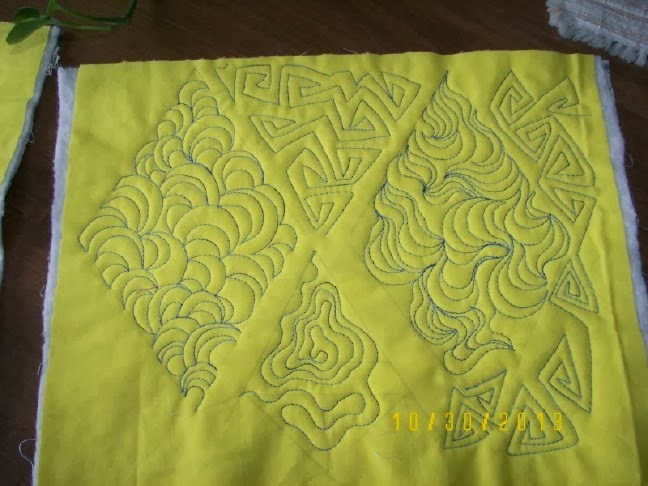 I was thrilled with the first McTavishing (diamond on the right) but by the time I got to the bottom, hypnosis seems to have taken over and I totally became "lost" in the design! Yes, I remember about half-way finished, "perhaps I need to stop for a few seconds" but I didn't. The diamond on the left is OK and I might use it, but in softer threads. The wonky triangles in the top middle look interesting and not as difficult as I thought. 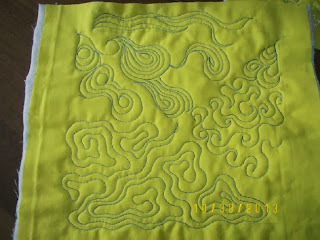 The wiggly lines in bottom center have the right "feel" for my scrappy stars, if I use a soft blue/gray thread. I've not machine quilted since ??? spring -- hey, a person gets rusty! It's amazing how much improved a design becomes with a little practice. This second practice piece is almost a total loss! The "wormy" thing on the bottom left has possibilities. I was using my own imagination which has a mind of it's own every 2-3 seconds! Even poor practice results are better then no results at all. If you are not appreciating my dark thread, remember that a thread that blends will alter your surface dramatically. My practice pieces are saved in a 3-ring binder in page protectors, just like PatsyThompson Designs.com suggests. Many times I can't think of any design, but that practice binder always has reminders. I am also practicing designs from www.FreeMotionProject.com, by Leah Day. I own her big beautiful book, and added a spiral binding to it. Free tutorials of all her designs from her book are on her site. These two generous machine quilters have given so freely. I have the hardest time choosing quilting designs! I need to learn from you to do more experimenting. I really like the diamond on the left in your first practice piece! I learned a valuable lesson this year. I had a lap top I loved and had it specialty quilted, gorgeous feathers etc., no space left unquilted :) just in case I had to have chemo along with radiation. Lucky dog, I didn't but when I washed the quilt it was just quilted. none of the lines showed anymore. It just looked like all over quilting. I sure it depends on the batting but unless I don't intend to wash it, I'm sticking with geometrics. Love the lines and they always show beautifully. 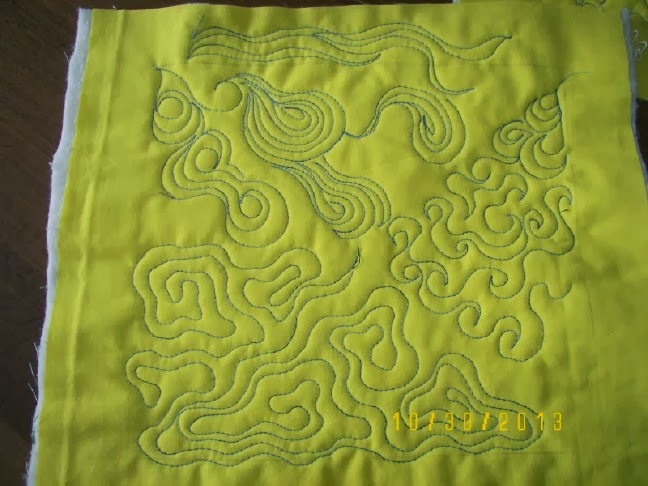 Great practice quilting though! If you quilt it they will come! I had said last year that I needed to sart doing practice pieces. I have been storing (printed out) "quilt stitch inspiration" pictures in a binder but need to also try doing some of the designs on fabric (BEFORE I try them on a quilt!) and putting them in the binder too. I love the work of PT and LD and am hoping to try using some of Angela Walters "modern" designs this year too. With FMQ, pratice makes confidence!